Khai’s journey started when he was born on February 10th 2018. He was born with gastroschisis, a condition in which a baby’s intestines are found outside of the baby’s body, exiting through a hole beside the belly button. Khai spent roughly 80 days in the NICU so doctors could monitor him before he and his mother Julia were allowed to go home. In June, Khai’s belly started to get very large and firm and Julia and Khai were flown back to Edmonton. On June 27th Khai’s doctors discovered that he was in end-stage liver failure. 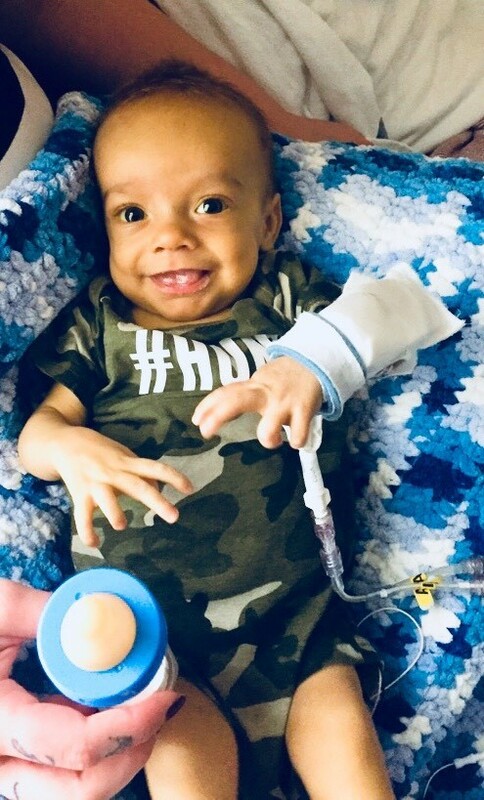 Julia began to be worked up to be Khai’s living liver donor while the medical team controlled fluid build up, nausea, dehydration, nutritional needs, and tried to get him to grow as fast as possible so that Julia’s liver could fit inside his little body. On October 15th, Julia was told that Khai had a non-constructible vascular system due to being so small and that the best decision for Khai was to get a multi-visceral transplant. On the evening on the 16th, Julia got a call that there was a donor and on October 17th Khai went in for transplant. Over the course of an eleven-hour surgery, he received a new liver, small bowel, and pancreas. Khai did extremely well through the surgery and stayed in PICU for only 6 days after transplant and was discharged from the hospital on March 4, 2019.